IS YOUR TRIGGER TOO SENSITIVE? Do people upset you in traffic? Do you go into grouch mode when hungry? Do common every day annoyances upset you and pull your trigger? How about people popping gum, clearing their throat, scraping their plate at the dinner table, cutting you off in traffic, rolling their eyes at you, flipping you off, cusses you out, tries to own you, disrespect you, or merely acts stupid…do any of these things pull your trigger and set you off? I want you to ask yourself: Do they have to? Is it worthy of sucking the time, energy, and resources out of your life by creating a stronghold on your attention? Think about it as you listen. And determine what you can release and let go for a happier and healthier life! You only have so much time, energy, and resources, so why waste it on unnecessary trigger points when you can use it to live your life for your priorities and focus on what truly matters in life. Learn to release what isn’t necessary and improve not just your life, but your health and stress levels, too! Tune in now! Are you enrolled in our weekly Maintenance THINK DRINK Coaching? It’s where you put that you learn into action. Join today! PS…Don’t forget to watch all the episodes! The Gift of Gab! Episode #45 Letting Off Steam: Am I Venting Or Gossiping? You know, that place where you need to let off steam just to remain sane. But when does venting become gossiping? Is it the same thing as gossiping? Can it lead others to gossip? Can it be fuel for fire that others will pick up and torch people with? Can I vent and be a person of integrity and protect myself and others while doing so? Venting IS a healthy part of life. But what signs may show me that I might be gossiping instead? What are the differences I can look for to determine which is healthy venting, and damaging gossip? Tune in now to find out! What can I do to vent that will not result in gossip? In what ways can I vent safely? Kick your Buts and Move Into Action daily! Want more? Register for PRIORITIZED or watch the Happy and Healthier People video training today! Don’t forget to watch all the episodes! Today I’m teaching on strengths (I discovered many of mine through motherhood) and the need for creating white space in your life for regular rest and relaxation. What are your strengths? Can you move at the speed of motherhood? Rely on intuition? Find solutions despite being stuck in gridlock traffic with a 3 year old and his full bladder? Can you relate to learning from life on the fly? Moving at the speed of motherhood? Do you also have built in intuition that brings on your “Uh-Huh” radar? Do you have these “Superpowers”? And despite your strengths, when will you schedule your white space so they don’t end up as your greatest weakness? This month’s topic in our Maintenance Coaching: Rest and Relaxation. Listen to the podcast or watch the video feed below! In finding our strengths to juggle life as we live it, we may find that those strengths are also your weaknesses? So, you can handle it all without dropping the ball. But is it healthy to do this day in and day out without taking time for yourself to rest and rejuvenate? Want more? Register for PRIORITIZED or watch theHappy and Healthier People video training today! Are you enrolled in our weekly Maintenance Coaching? It’s where you put that you learn into action. Join today! The Gift of Gab! Episode #40 The Rut of Weekend Catch Up! Are you someone who pushes everything off for the weekend? Sometimes by the time Friday hits, we’ve pushed so many responsibilities off to the weekend, that we’re already overwhelmed and find it difficult to enjoy our time off. This segment was our first video segment simultaneously broadcast LIVE on Google Hangouts and Youtube while broadcast LIVE on BlogTalkRadio! Whoohoo! We did it! (I had to do it twice, but it worked!) Take your pick…watch it by video or listen via podcast. All of these things can take up so much time that we find it impossible to get it all done in two days. PLUS, by the time we get through them all, we’ve likely realized we still haven’t had a chance to relax, just enjoy home, unwind, and do some fun and entertaining things. Can our lives feel more like a vacation if we change our weekdays to free up our weekends for some different priorities? Listen to the show to find out how little changes in your weekly routine, can mean big changes for your weekends and your vacation mode of living. Small changes can have HUGE impacts! Enjoy more of your life now! Want more? register for PRIORITIZED or watch the videos today! But as the title suggests, it’s also one of my most perfectly real shows about life and it’s unexpected events wrecking havoc on my vision of what is perfect. I had to take my daughter to an unexpected doctors appointment at the same time my show airs, so instead of canceling this segment, I decided spontaneously to prerecord it from my living room. This stroke of genius occurred at the same time our crazy boxer decided to play “chase the tail of our Tomcat”. This, as you can just imagine, compelled Friar Chunks (our big kitty) to pull out the claws and spare no mercy. You’ll notice the yelping in several places (and my laughter)! Talk about hard to concentrate and focus! SHEESH! Our lives, relationships, careers, finances and other life areas can easily be affected by the idea of perfectionism instead of the reality of what is perfect and OK for our situations, circumstances, family dynamics and more. Our perceptions may be WAY off! And if we always chase some version of perfectionism, we can end up chasing things forever, never find them, and completely miss the enjoyment of what we do have—even in their imperfections. While this episode is perfectly imperfect, it is perfect for today and the circumstances that popped up in my life, and despite it, I think there are some valuable lessons in it for us all. The dog and cat are merely a bonus and add a realistic flair to how life usually happens. Remember: the perfect life is a perfect lie. It doesn’t exist. The enjoyment comes when we simply decide to live with what we have while embracing the unexpected as part of the experience and rolling with it. So today remember to breathe. Don’t be so hard on yourself. Do what you can and learn to be OK with that. Remember to relax, and make the best of what you’ve got. That in itself can make any imperfect life seem so simply perfect. Registration is OPEN for PRIORITIZED! 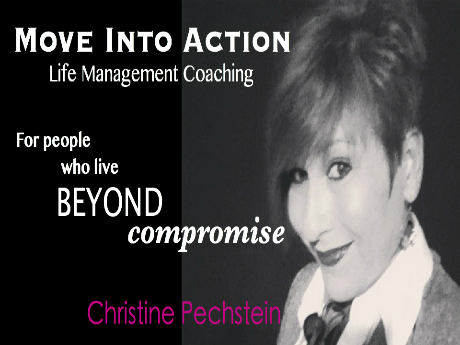 Life and Stress Management Group Classes start SOON so don’t miss your opportunity to participate in these LIVE training and coaching sessions with Christine!